Back when I was just out of college, I was fortunate enough to substitute teach in a kindergarten class under an excellent teacher. As a high school teacher, I never thought I would like Kindergarten, but I still enjoy teaching it. 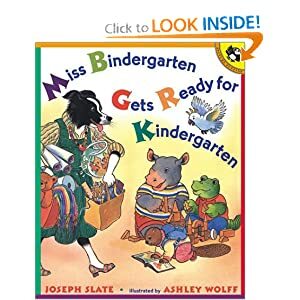 But now I am teaching Eloise, and there isn’t the time or space or energy to devote to a Miss Bindergarten classroom. So this is our schedule for Kindergarten. Would you like to join us for a day? This bookcase is our “supply closet”. I used to fill up the entire basement with stations and such, but now we have a bookcase. This is our school room–the floor of her room. It is Eloise’s job to get the stool from the bathroom (for her desk) and two pillows (for our backs) before school starts. This is my clipboard with our schedule. Even though we do this everyday (well four days a week), I still need it for reference. My schedule is divided up into categories. We always start with Calendar Time. CALENDAR TIME: Eloise adds the current date. I made this calendar, but you can buy them at The Dollar Tree. Velcro allows the dates to be added and taken off. I also drew up a few holiday tags with pictures of the major holidays and birthdays. Then we chant the months of the year, and once again clap on the current month. We then do the same thing again for tomorrow. “Tomorrow will be (Thurs., November 28, 2012). And the same routine with “Yesterday was. . . .
Then I drill. “What day of the week is it?” “What year is it?” etc. . . WEATHER is a rather easy segment of this day. We just peek out the window to see what the weather looks like. Next year, I will add a thermometer. Then we guess what the weather will be tomorrow. At this point Eloise usually puts up what she hopes the weather will be–like snowy. I say, ” Today we have been in school 44 days. Today’s number is 44.” Eloise usually interjects the number as she changes the number on our wall. My independently owned Dollar Store carries vinyl letters and numbers. I buy 5 stacks at a time and use them for everything. Eloise then writes Todays’ Number on her dry erase board. When she has it “perfect”, I give her a star. She then writes the number on a star. I give her The 100 Chart, and have her count up to Today’s Number, while I. . . Put the star on our wall. Well out of the reach of Little Man who would love to take them all down. Then I have her count up to 20 and back down again using The 100 Chart. To learn place value, we use two covered cornmeal cans, some popsicle sticks, and some rubber bands. The cornmeal cans are labels as 10’s and 1’s. I give them to Eloise and have her place them correctly. We then add a popsicle stick to the Ones Column (that is what we call the jar.) When there are 10 popsicle sticks in the Ones Column we get to put a rubber band around them and move them over to the Ten’s Column. We then count the popsicle sticks and write the number below the corresponding jar. When we are counting the bundles popsicle sticks we count by tens. We will add the 100 Column when we get there. We have a Penny Jar. Each day we add one more penny. When we reach 100 pennies, we will roll them and take them to the bank. With her first dollar, we will open a saving’s account. (Credit Union’s are wonderful to kids.) But before we add a today’s penny, I ask, “How many pennies are in the jar right now?” Usually Eloise needs to refer to The 100 Chart to see which number comes right before Today’s Number. THE LETTER OF THE WEEK: We move into this section by singing the Alphabet Song. We have a new Number of the Day every day, but we only study one letter per week. This week we are studying “I”. Eloise gets down the Alphabet Cards. If she says the name and sound correctly, she gets to keep the Alphabet Card. If she misses, then I put it at the bottom of the stack and she has to try again. I write both a capital and a lowercase “I” on her dry erase board, then she copies them. Those are check marks below each letter. She adds them. It means, “I did a good job,” she said. Since the dry erase board is out, we also practice her vowels and vowel sounds. You will see this at the end of my Schedule, but I have found that it fits in better right here. I add a consonant in front of the vowel, and then add a consonant at the end. Eloise likes to make “words” for me to try to read. Sometimes I get words like “iet”. Eloise is struggling with phonics. I was talking to my mom and she said that she remembers liking sight words, so we added sight words to our routine. Now I know many Kindergarteners graduate knowing 100 sight words, but Eloise is Eloise and we are going at her pace. Before putting the sight words away, Eloise copies them onto her dry erase board. Up to this point, we do the same thing every day. But for our Math and Reading sections we vary the activity each day. That is where the Wednesday Basket comes in. These cookie trays and magnetic letters came from The Dollar Tree. I have two cookie sheets and I call out a letter. Eloise has to find both the lower case and the capital letter. She then places the letters on her cookies sheet. These cookie sheets also work well on road trips with magnetic paper dolls. We find all the letters up to the letter “I”, then she alphabetizes them–in her own way. I haven’t mentioned this book, Montessori at Home, but it influenced how I teach. One thing stressed in Montessori teaching is “a place for everything, and everything in its place.” While my home doesn’t look like it, I do try to have Eloise put everything back. That is what she is doing here. These trays will then go back to her bookcase in the Wednesday section. We use the writing program, Handwriting Without Tears. It uses wooden slats, then a slate to teach the correct way to make letters. Here Eloise is using the top and bottom of the slate to make a capital “I”. And when she is finished, she will put the slate, the chalk, and her eraser back in the zip lock bag and zip it up. On the schedule is an alphabet puzzle, however, Eloise can do that independently, so I shove it down to the last thing we do. Moving on to MATH: Again, the activities vary each day. Today we have Wooden Numbers. After putting them in numerical order, she gets to use a ruler to hit each block the number of times represented by the number. Eloise always is fascinate with this. She always says, “It sounds out its name. Can you hear it Mommi?” Now if Eloise is struggling in the Phonics department, I’ve discovered that she “gets” numbers. Then we see how many different ways we can get make the number “10”. And in keeping with the Montessori philosophy, Eloise puts all her Wooden Numbers back. Now Montessori philosophy stresses quietness and order (there is a correct way to put things away), but I let her slide the Wooden Numbers off into her shoe box. And since I am not in a hurry today, I let her play with the Cuisenaire Rods before putting them back. She has this activity to complete, but since she can count out Cheerios by herself, I give it to her to do later. One last magnet board activity, and we can move on the Literature. Eloise practices the sounds of letters. . .
Then I read one chapter from this book. Another page of letters, and then I read. . .
. . .two pages of poems. Eloise chose this book that I picked out at the library. One more library book, and our school day is over. Well except for the puzzle in the hallway. Thanks for spending the afternoon with us. Here are a few more activities that we do on different days of the week. Use dice to count up to 12. Sandpaper letters on wooden flashcards. A big Book About Me on fabric. Here is one more page from the Big Book About Me. I just sewed several layers of white fabric together. Bingo Markers (found at the Dollar Store for 50¢) are fun. We use them to make letters. I bought these flash cards from Pottery Barn a few years ago, but I think you could easily make your own with a camera and some card stock paper. This is a hot plate–the kind that keeps food warm in a buffet. I cover it with aluminum foil, and let Eloise color pages on it with crayon. It does warm up, but not hot enough to “burn” just hot enough to not want to handle. We are making an ABC Book using stencils and crayons on the hot plate. Here are our letters so far. Just some of our ideas. This entry was posted in She said... and tagged homeschooling kindergarten, teaching for cheap. Bookmark the permalink. Ohhh….I do so miss teaching kindergarten. But only when I stop to think about it : ) Thanks for making me think about it so sweetly this afternoon! Incredible. I desperately want to home school my girls but I am so terribly intimidated by the prospect of creating a schedule and terrified I will miss something imperative. Thanks so much. I saw pictures of Tom and Jane enjoying Florida! So now I sort-of understand what is actually happening in my Kindergartener’s classroom! I only ever feel like I have half the story from our 5-year-old… Thanks for the sneak-peak! I should ask Eloise to discribe her day. It is interesting exactly what makes an impression on little minds. Just at Dollar Tree. That is also where I bought the cheap cookie sheet that is our magnetic tray. Hope that helps. These are some great ideas – thanks for taking the time to share! I like the boxes for each day…. I think that would help me to be a bit more organized, too!